In 100 downloads of the NetWrix Password Manager, more than 58% indicated three key features as desirable and are all found in this product. Password Management tools have become extremely popular because of the many varied resources users access on a daily basis. Even with improvements in technology overall, vendors each have their own approaches to security making the need for a password management tool a necessity for organizations that extend their resources beyond Windows services. Since Windows services represent the most common IT asset, having a self-service password management tool can save hours of troubleshooting, calls to the help desk, and frustrated users. 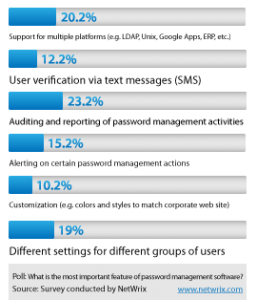 The top-3 self-service Password Management features were: Auditing and reporting of password management activities at 23.2%, Support for multiple platforms at 20.2%, and Alerting on certain password management actions at 15%. Combined, these three features give Administrators and Help Desk personnel flexibility and control over user access to network resources and by delivering them as a self-service password management service, users are able to quickly and easily assist themselves without having to go through support. The larger the environment, the more time and support cost savings may be realized. The NetWrix Password Manager offers all three of these key features and more. Using a secure question-and-answer system, authentication and password resets are achieved by answering questions only the user knows based on initial enrollment. It can also leverage existing HR database information to pre-populate Q&A pairs to maximize effectiveness and speed deployment. Full integration into the Windows Logon Prompt (GINA) is standard and eliminates the need for self-service kiosks or phone-based systems. It also provides synchronization with Google Apps accounts. It protects against brute-force guessing by limiting the number of failed attempts. This powerful self-service tool can be setup most anywhere in the environment: Behind the firewall, in the DMZ or Internet-facing to meet any need. All password reset events are logged to help sustain compliance and reports are automatically generated for viewing by IT staff and auditors. Alerts may also be setup to notify IT staff of critical events or problems. The product also allows for customization of the logon screen, as well as the self-service portal including text and graphics. 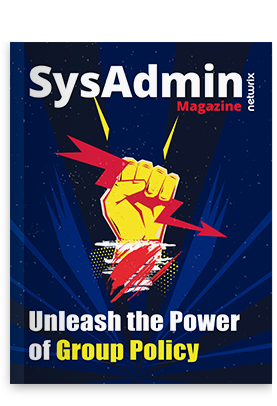 It offers manual and auto-enrollment including deployment via Group Policy or standard software deployment mechanisms and uses your existing Active Directory infrastructure. Furthermore, three roles can be assigned to separate interfaces for self-service access, help-desk operators, and administrators to restrict features to tailor the experience to the user. It also offers an optional Password Expiration Notifier add-on to further automate password management and Inactive Users Tracker add-on to monitor accounts that have gone unused to help improve security. Best of all, the product is available free of charge up to 50 users. What are you doing today to ease the burden of password management? What other self-service mechanisms have you successfully deployed to end users and have you been able to show a positive return on investment? Please provide your comments and feedback below. Astounding need for analyzing Windows logon events.